Innovation & Connection at Your Service! The future of manufacturing is changing: factories need to be smart and machines need to be smarter. 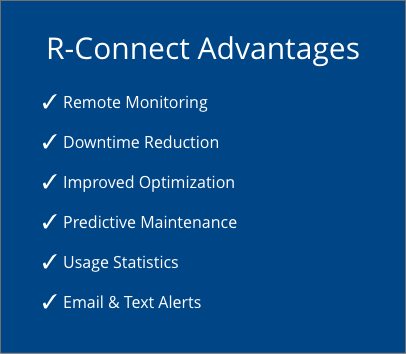 R-Connect does just that, by putting performance monitoring & optimization at your fingertips. Connect with your machines remotely to investigate alarms, adjust parameters, & respond promptly. Our latest innovation was developed to provide usage and performance data enabling our customers to meet Industry 4.0 demands. R-Connect drastically reduces downtime by giving you informational transparency. Be empowered with actionable insight to continuously improve performance, cost savings, & automation. The tran­quillity of maximum productivity as a result of constant monitoring of proper machine operation. Robopac launches R-Connect, a technologically advanced monitoring system that combines innovation and connection, thus enabling complete control of machine operation and total sup­port to the end customer. This is a pioneer innovation in the field of semi-automatic machines, which Robopac makes available to dealers and especially, end-users, but also provides a system upgrade that can be applied on more advanced machines. Powerful, plug & play and user friendly, R-Connect is a “turnkey” system for the end-user: the main advantage is total “peace of mind”, which is absolute tranquillity regarding machine operation, which includes production performance verification and optimisation of all manage­ment costs. In fact, the system minimises machine downtime and manages maintenance oper­ations better, also providing an immediate troubleshooting procedure, until the full and remote upgrade of the machine’s management software is completed. The device can be installed directly on the machine or integrated at a later stage. In fact, Robopac machines are already set-up to install a special Gateway that sends all information in real time, making it available in the Cloud, with statistics that can then be used via a simple internet con­nection from any device (PC, tablet, smartphone, etc.). 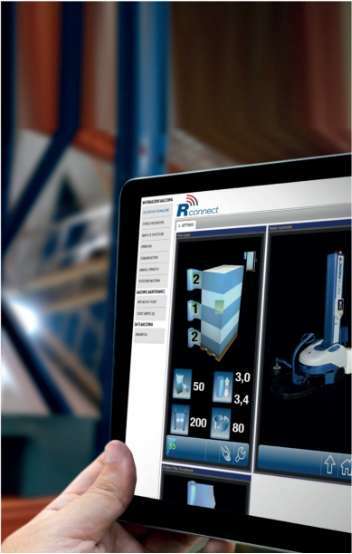 In brief, the main goals obtained by using R-Connect are: production optimisation as a result of performance assessment of the machine and parameter and production verification; statistic monitoring, with the option to program and modify the wrapping cycles, analyse data via an integrated management system and schedule maintenance; rapid solution, even preventive, of problems via signals sent by the said machine to the dealer or directly to the Robopac tech­nician, who can therefore achieve rapid and precise diagnostics and provide remote or on-site interventions, thus drastically reducing machine downtime. This system, which forms part of Industry 4.0 technologies, also enables Robopac to have a better understanding of use of its machines, providing useful information for the constant development of its technologies so as to fully respond to the actual requirements of users, and thus satisfy their needs.